Mat Velvet is a superstar circus acrobat and Wheel God. After all there is only One Wheel Man. Sharing and giving unto the world. Training in circus and Wheel gymnastics for over 20 years, he is here, at last, to share with you his skill, his talent, his art and his passion. He performs a beautiful choreographed German Wheel routine, dresses himself in the highest quality fabrics one can afford showing off his truly unique style and sports a very elegant moustache. Martin Varallo a.k.a. Mat Velvet is a comedian, clown, mime, and improviser. He has worked with 'Pomp, Duck and Circumstance' in Berlin and Teatro Zinzanni in Seattle and San Francisco. 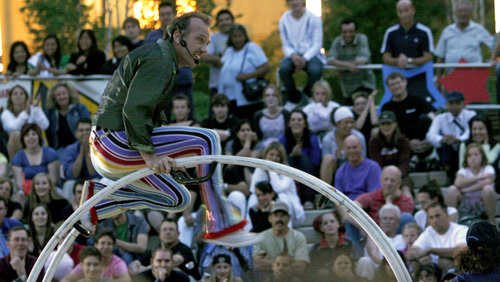 Has performed his solo comedy routine with Cirque Du Soleil and performed at the worlds best comedy festivals. He is an expert MC for coporate galas, special events and private functions. He was a founding partner in the highly successful duo Stretch People. A company that produced many comedy routines and theatre shows incorporating manipulation of objects, eccentirc dancing, physical comedy, verbal rubbish and even live music.